In order to treat dehydration effectively (see dehydration symptoms) you need to replace the fluids and electrolytes that are lost due to the cause of the dehydration. ORT or oral rehydration therapy is no news today. The successful approach to dehydration today depends on the age of the person, the cause, and ultimately the severity of the dehydration. Fortunately today there are numerous different types of rehydration products (SOS is a portable electrolyte powder satchet) to suit just about any situation. The majority of these products are useful for minor to mild dehydration, easy to use, and ultimately highly effective and successful. When a person became severely hydrated it is of utmost importance to get medical help at the soonest. Severe hydration requires professional medical attention and trying to remedy the situation with rehydration products is highly discouraged. As strange as it may seem, although water seems to be the obvious choice to rehydrate, it does not contain the required electrolytes that is needed for proper rehydration like the numerous rehydration products can provide. Rehydration products dramatically changed the way dehydration is treated today. Read more: Why Electrolytes are Important. Of all, water remains the best hydration drink in normal conditions and situations where you do not do demanding physical activities and are not exposed to extreme weather conditions. However, when you have to deal with a person that is already dehydrated, water alone will not be effective, but it is a good point to start. The best way to do it is to drink small amounts of water with regular intervals. There is no good in slugging down litres of water at once. Your kidneys will simply expel the excess fluid and does not allow the body to absorb it properly. Sports drinks are seen as a rehydration product due to the high electrolyte count it contains. It is a better choice than water because of the electrolyte content, yet, the high sugar content in these drinks are not always desirable. It will however help your body to preserve the fluids you consume. The best choice would be the sugar free versions of these drinks. ORT salts are a well know product that usually comprises of a tablet containing minerals, electrolytes and glucose that is needed to hydrate the body. It is used by dissolving it with water and can be consumed through the day. Electrolyte solutions are one of the most effective rehydration products. It is ready to drink and convenient to use. Because it is comes ready to use, it is perfectly blended with just the correct amount of water in relation to the electrolyte blend, thus is there no risk in mixing it too weak or to strong. Electrolyte sachets is compact, and convenient and the perfect solution for people on the go or who travel frequently. All you need is water to add and mix it well. There are numerous recipes for ORT solutions. It is often advocated to be cheaper, but it is vital to note that the ingredients need to be measured precisely and in perfect ratio with each other to be effective. It can also have an influence on the reliability of the solution. Read about What to do after drinking alcohol. SOS Hydration products are fast acting hydration booster drinks with electrolytes. Electrolyte replacement drinks are designed to prevent and assist with dehydration due to demanding physical activity and fast paced lifestyles. 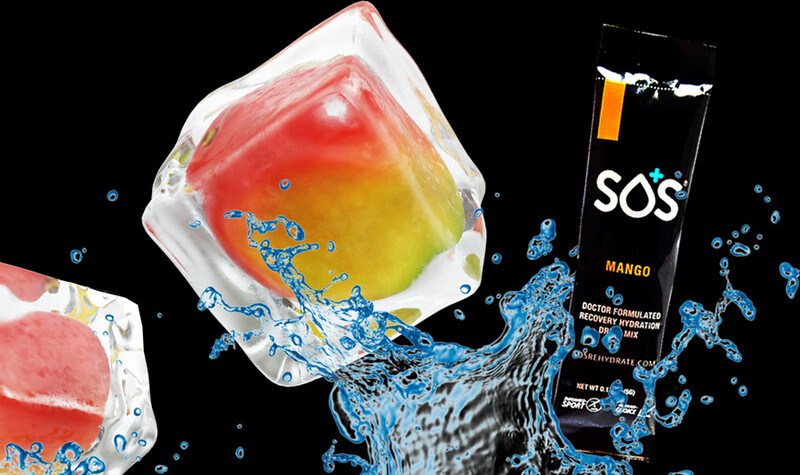 Distinctive from other typical sports drinks, SOS Hydration contains 75% less carbohydrates and up to 50% more electrolytes. Comparing to some energy drinks, SOS Hydration does not contain caffeine and excess sugars that provides an artificial energy boost, but instead focus on hydrating your body efficiently. With the correct blend of electrolytes your body will be assisted in obtaining the maximum rehydration benefits from water to ensure you are hydrated better and remain hydrated for longer. It should be easy to choose the best rehydration product for your particular need.